We are making. living. better. Here's how. Enjoy easy access to major markets and a top-tier international airport. All from the gorgeous foothills of North Carolina. We’ve been focused on meeting the workforce needs of our industry partners for more than 50 years. We can help you too. Manufacturing makes up 27% of our workforce, compared to 10% nationally. It’s in our blood and we’re quite proud of it. Catawbans share unique stories about crafting a good life for themselves, their families, and others in Catawba County. Here's the bottom line—we want your business to be part of our dynamic economic region. Catawba County, NC offers a wide range of building and site options, and you’ll definitely benefit from our adaptive and well-trained workforce. Whether you’re engaged in advanced manufacturing, light assembly, data centers, distribution, corporate or back office functions, you’ll be welcome in here in Catawba County. We are a community of makers and doers, who enjoy a good quality of life while working together to make a difference for the better. Join us in "Making. Living. Better." Want to know more about Catawba County? Check us out on Public Media North Carolina. Catawba County is featured in the February 2018 issue of Business NC. 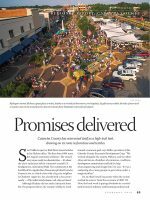 Read how "Catawba county delivers on its promises." Catawba County Making. Living. Better. Catawba County and its municipalities consistently rank high in national lists and publications. Forbes.com ranks the Greater Hickory Metro as having the lowest business costs in the nation for 2018. Since 2006 the metro area has been ranked no lower than 6th. Inc. has ranked Hickory among its 6 cheapest cities in which to start a business and NerdWallet named Hickory and Conover the 4th and 6th best places to start a business in North Carolina. USA ranked Hickory as the third biggest economic gainer of 2017 after rising 64 places on the Miliken Institue's list of Best-Performing Cities in America. Long considered a center of the manufacturing industry, Catawba County and the Hickory Metro have spent years diversifying their industrial base. Just some of the diversified manufacturing sectors that call Catawba County home include machining and metal working, plastics, fiber optic and coaxial cable and furniture. Catawba County led North Carolina’s data center recruitment efforts with a focused approach to targeting data centers through the development and marketing of the NC Data Center Corridor. Catawba County’s manufacturing prowess is supported and accentuated by a rich geography and diverse lifestyle that has brought the area national recognition. Catawba County is not just a great place to do business, it's a great place to live for people of all ages. National Geographic ranked Hickory in the top 30 best small cities in the US noting its hipster-friendly offerings. The Economic Policy Institute ranked the Metro area the 2nd least expensive MSA in North Carolina for a family of four. Safehome.Org ranked Hickory the No. 20 safest city in North Carolina, based on low violent crime and property crime rates, as well as the best citizen-to-officer ratio. Movoto listed Hickory in their 10 most exciting places in North Carolina coming in 5th in North Carolina for the number of nightlife venues per capita and also ranking well for its number of non-fast food restaurants. The Kiplinger Letter ranked Hickory in the top 10 best places to retire in the U.S. in August 2017, detailing its moderate weather, low cost of living, vibrant arts scene, access to quality health care and revitalization efforts as evidence of a thriving quality of life. Newton ranked as 2nd Best Business Environment of the state’s 50 largest communities. Hickory Metro area ranked 2nd least expensive MSA in North Carolina for a family of four. Hickory MSA ranked 5th in NC for number of nightlife venues per capita and number of non-fast food restaurants. Shurtape Technologies, LLC, to invest $31.4 million and create 100 new jobs at new distribution center and future manufacturing facility in Catawba, N.C.